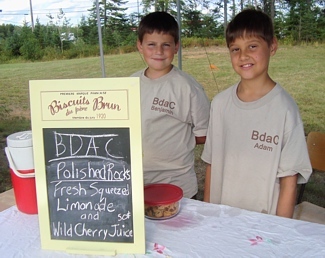 The potential sound of coin jingling, and flowing entrepreneurial ideas geared Benjamin Dellacecca and Adam Couture to launch BdaC in 2010. The summer of 2010 was a successful series of setting up their BdaC Stand to sell product throughout the summer. Wares included polished rocks and homemade juices. Both boys are rock hounds, spending time out in Jellicoe and Pass Lake area acquiring their treasures and both have their own rock tumblers at their own homes. The process of polishing rocks takes 40 days using different types of grit or polish. You can see their sparkling polished rock collections; semiprecious gems, antique polished glass, Hudson Bay agate, Northern Ontario amethyst and some jewellery items at various venues throughout the summer or can give them a call at 887-0046. They also sell delicious homemade lemonade (pre-order available), lime aid and wild cherry juice. The business has expanded this year to also include guided walking tours of Paddle to the Sea Park (silver collection). They would be happy to hear from you! Beautifully sculpted Ice Candles – made by hand, with love – call (807) 887-0046 to place your order. Nipigon – home of the world famous Nipigon Nylons. 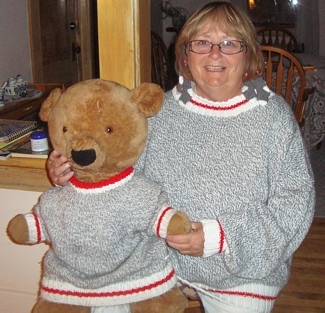 Here is a photo of Levina sporting a sweater in the famous Nipigon Nylons colours. The New Beginning Circle trademarked Nipigon Nylons in 2008. They can be purchased locally at Skandia House B & B, Nipigon Fun Dollar Store, Twigs in Bloom or the Nipigon Museum.